I swear spring is coming. One of these weeks, the high country of Colorado will thaw out and all those beautiful alpine lakes will be free of snow and ice. It’s just not going to be this week. 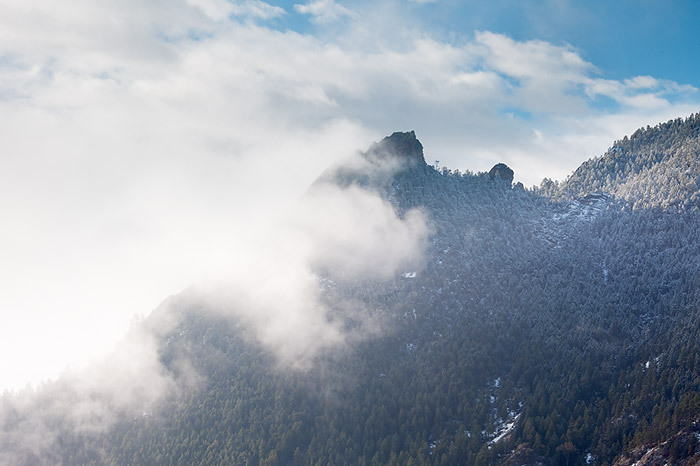 Regardless of the typical spring weather we’ve been experiencing on the Front Range, its great to get out of the office, and into the field to shoot scenes like this. Some of my best winter like scenes are actually photographed during the springtime. Springtime in Colorado and Rocky Mountain National Park tend to be snowy and wet. Perfect conditions to photograph more intimate scenes of nature that may not photograph so well under harsher sunlit conditions. The past few days have seen a typical unsettled weather pattern moving affecting the eastern side of Rocky Mountain National Park. Storms moving through the Colorado from the Pacific have been dropping a few inches of heavy wet snow every few days. 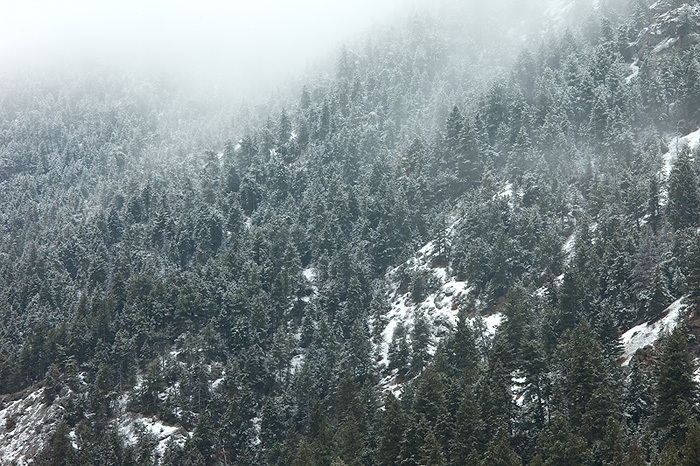 Heavy wet spring snow coats the conifers lining the slopes of Rocky Mountain National Park, and fog drifts in and off the peaks periodically. The weather causes diffused lighting conditions. I spent the last week photographing the Moraine Park area as these storms would pass through Rocky and came away with many unique images. I love how the lighting conditions render the scene with a cooler blue hue and the pine trees in Moraine are weighed heavily with fresh spring snow. It was a good week for photography and I would certainly welcome another week of unsettled weather. I promise, before you know it I’ll be posting images of pristine Alpine lakes reflecting majestic peaks, its just not going to be today. 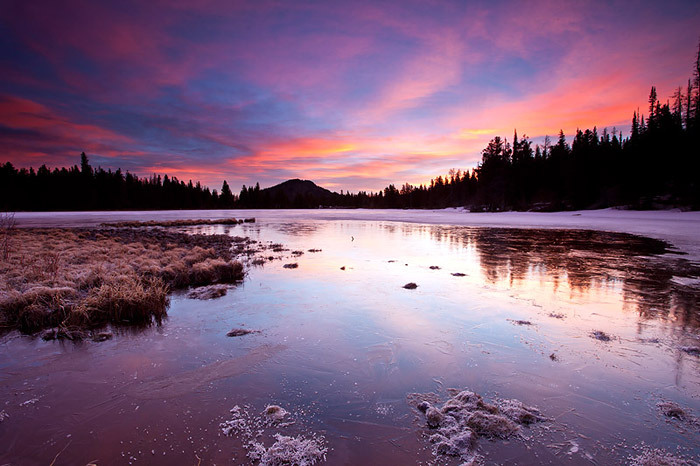 Posted in Colorado, Rocky Mountain National Park on April 27, 2011 April 27, 2011 by Tom Mangan. Even with the mild winter we’ve had this year, the transition into spring from winter never seems to occur at a pace we would like. It can often feel like were taking one step forward with a warm spring day and then two steps back when you wake up to find snow on your car in the morning . The lower elevations around Boulder are starting to show signs of life as the grasses are starting to green and some of the early bloomers are sprouting buds. People who follow my photography know that one of my favorite subjects are trees. I find the form and shape of trees fascinating. They make for great subjects for photography but learning to compose and arrange successful photographs and images of trees can be very difficult to achieve. When photographing trees, one of the first things one must do to capture a successful image is to learn to arrange the chaos into a cohesive image. It’s just as important in photography to learn what to exclude from and image as it is to understand what elements should be kept in the scene. This could not be more true when photographing trees. Often when I make a successful image of trees, the scene grabs my eye as I walk by a location. These photograph is no exception. I was hiking on the Bobolink trailhead which is part of Boulder, Colorado’s beautiful Open Space and Mountain Parks system. I was interested in the budding bushes that were growing along the creek in a classic Colorado riparian habitat. These bushes on their own were not compelling me to setup my camera and make images. It was an overcast day, which are the conditions I favor when shooting more intimate photographs of trees and landscapes. Photography is about capturing light, and the soft diffused light of an overcast day helps to evenly light a scene and prevent harsh shadows from obscuring details. Soft diffused light helps to create a more painterly scene and allows for all the subtle detail, shapes and colors to shine. 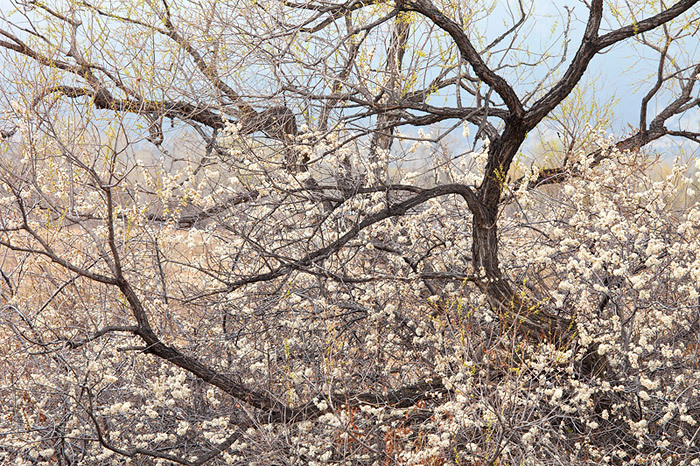 As I walked by this scene, the combination of the budding flowers and this beautiful Cottonwood tree caught my eye. It was quite a challenge to arrange the chaos present in this scene into a cohesive image. After many lens changes, multiple tripod setups and compositions I was finally able to arrange a pleasing composition. I eventually settled on using a telephoto lens to help compress the scene and isolate the bending branches of the cottonwood trees amongst the budding bushes. Posted in Boulder Open Space, Colorado on April 22, 2011 by Tom Mangan. One of the common weather jokes in Colorado refers to the constantly unpredictable weather conditions. People here in Colorado often joke that there are two seasons, winter and August. Though in reality Colorado does have four seasons, spring and fall can teeter between summer like weather and winter like conditions. Spring on the Front Range of Colorado can be very unsettled and snow is a common theme. By April were all ready for summer like conditions and a cold drink by the pool. Mother Nature usually has other ideas and April is Colorado’s third snowiest month. This spring has been dry on the Front Range so some late season snow is appreciated. For photographers the snow will help bring spring wildflowers which will soon appear. I took advantage of a late season April snow storm to head up Flagstaff Mountain just outside of Boulder. Flagstaff Mountain is one of my go to locations. For me it’s a short drive to the mountain and access to some classic Colorado scenery. I love the diversity of the area. 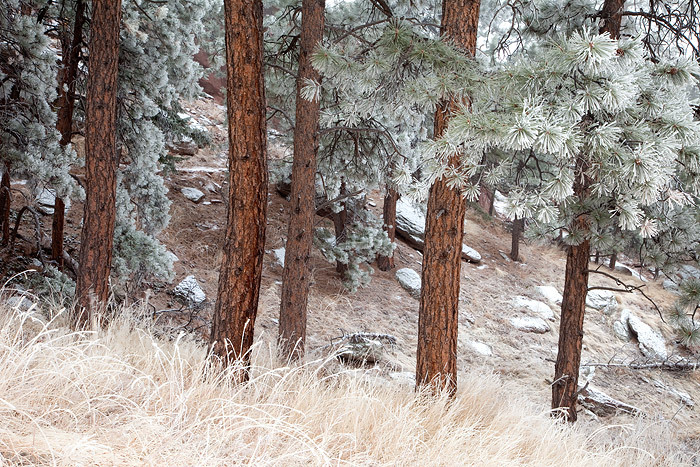 Flagstaff Mountain is dotted with Yuccas, Ponderosa Pines, Bluestem grasses and Granite boulders. These make for great photography subjects when covered in snow and fog. 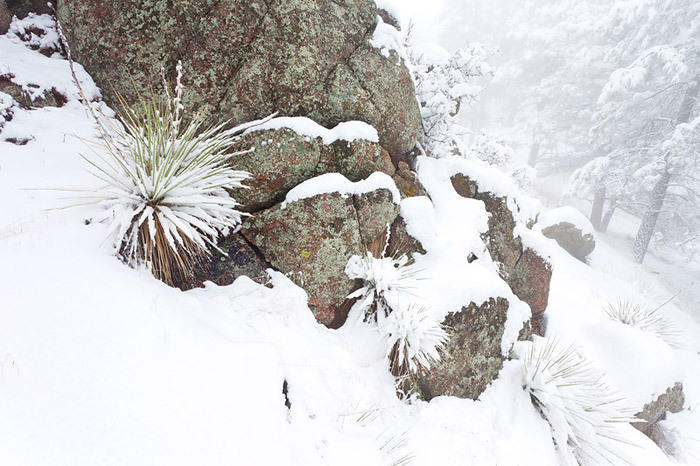 No matter how many times I photograph on Flagstaff Mountain in weather conditions such as these, I never cease to find new compositions and limitless opportunities to create unique and original imagery. Posted in Boulder Open Space, Colorado on April 17, 2011 by Tom Mangan. Sometimes in life we take things for granted, especially simple things. I chose to live in Colorado because of its many beautiful locations. One of my favorite local areas to shoot is Rocky Mountain National Park. While I love to travel near and far to explore and photograph new areas, I find I am most productive when photographing places that are local. Local haunts allow me to return time after time to a location. Many of these locations I have visited on hundreds of occasions under all types of lighting and conditions. I can study the light, understand the weather patterns, all of which help to maximize my chances of capturing successful imagery. This morning was a little different. When I went to bed the night before, our politicians were bickering and grandstanding attempting to settle our 2011 budget crisis. If the budget was not settled within a few hours of my going to bed early in order to wake early for sunrise, there would be a government shutdown. One of the casualties of the shutdown was going to be the National Park and the National Park Service. Of the countless times I have visited Rocky Mountain National Park, it had never occurred to me that it would be possible to have access restricted and the Park closed. I regularly visit and photograph Rocky Mountain National Park impressed that those who have come before me, had the foresight to protect this beautiful area as well as to keep it open to the public. When my alarm went off at 2:30 AM the first thing I did was check to see if I would be able to access Rocky Mountain National Park. I had gone to bed feeling disgusted and disappointed over the fact that Washington politicians could not do their job and complete a budget. Not only was it possible that I would not be able access Rocky Mountain, but it was possible that thousands of employees would be out of work and furloughed. Luckily a budget was agreed upon and the National Park Service did not have to close or restrict access to the National Parks. Because I was unsure of what I would be doing this morning, I took a wait and see approach to my photography. Normally I like to plan where and what I will be photographing. On my drive up to Rocky Mountain I could see that clouds were present to the east, but not to the west or over the Continental Divide. I needed to find a location where I could setup and hopefully catch those clouds off to the east light up as the Sun rose. I knew that Sprague Lake has a nice unencumbered view to the east. I also figured that Sprague Lake might be starting to thaw out and that I may be able to find some open patches of water to catch a reflection of the clouds if the sunrise worked out as I had hoped. I arrived at Sprague Lake to find almost all of it still covered in snow and ice. There was however, a small area on the west end of the lake with a thin layer of ice, not covered by snow. The eastern horizon was showing promise and the clouds were showing hints of pink and magenta. I quickly setup the camera and was not disappointed. To think I almost missed out on this beautiful sunrise. Posted in Colorado, Rocky Mountain National Park on April 10, 2011 April 10, 2011 by Tom Mangan. 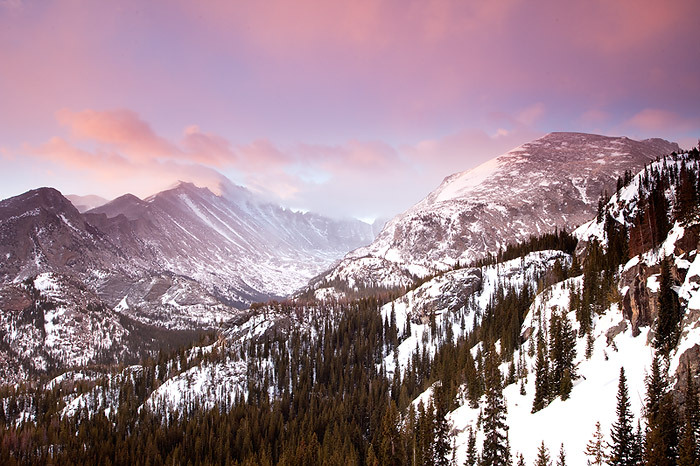 The most prominent peak in Rocky Mountain National Park, is also its tallest. Longs Peak not only dominates many of the views for the east side of Rocky Mountain National Park, but dominates much of the view from the entire northern Front Range. 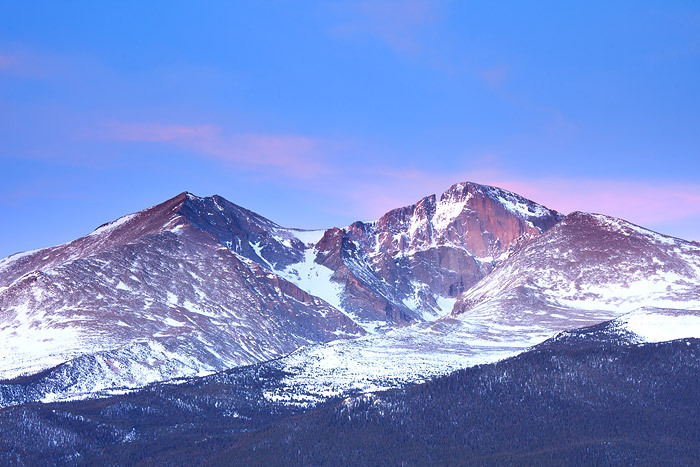 AT 14,255 ft high Longs Peak is Rocky’s largest peak and one of Colorado’s 54 so called 14’ers. There are lots of great photographs to be had of Longs Peak but one of my favorite views is from the areas around the Tahosa Valley along Highway 7. While the views of Longs Peak and Mt. Meeker are spectacular from the floor of the Tahosa Valley, a hike up the Twin Sisters trailhead helps elevate the view providing an even cleaner perspective of Longs Peak and Mt. Meeker. This morning, the trailhead was still packed down with snow. Snowshoes were not necessary but my indispensible Yaktrax helped keep a firm footing while hiking. There were lots of clouds floating around the area this morning but the larger groups of clouds stayed north of Longs Peak. I managed to get some nice pastel light on the peaks just prior to Sunrise. I really like to photograph subtle light such as seen in this photo. I certainly have photographed Longs in much more dramatic light than I captured on this morning but even so I find the color palette pleasing. Posted in Colorado, Rocky Mountain National Park on April 3, 2011 by Tom Mangan. Opening Day, for Baseball that is. This has to be my favorite day of the year. It signals an end to what always feels like too long of a Winter. It signifies that Springs is here, and Summer will here even sooner. Each day stays lighter longer, and the Sun begins to feel warm and comforting again. Of course for every Baseball fan, hope springs eternal on this day. Every team starts off 0-0, and every team still has hope. For Photographers, the time around Opening Day also signals a change. New opportunities will soon present themselves. 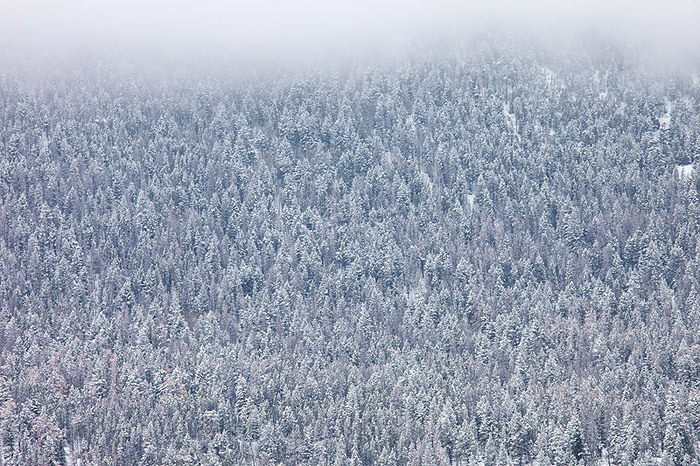 Snow draped pine trees and peaks will soon begin melting. Leaves will start to bud on Aspen trees and Maples. Grasses in the Meadows will begin turning from brown to green, and sooner than later will begin to yield the first wildflowers of the year. It’s also a time to pull out the map book, do some research and start planning where our Summer photo expeditions will take us. Hope does indeed spring eternal on this day. Excitement builds not only for what the Baseball season holds, but for what new opportunities, trips, circumstances and places the budding new photography season holds. Lets go Yankees!. 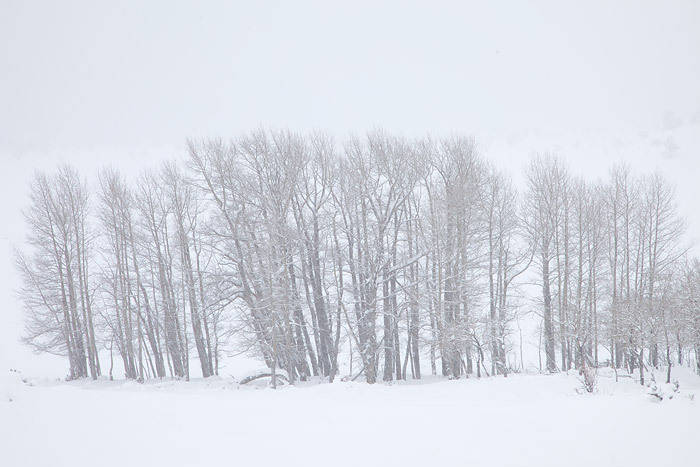 Posted in Uncategorized, Utah on March 31, 2011 March 31, 2011 by Tom Mangan. Some of my favorite photographs have been taken during in less then ideal weather conditions. Weather can make or break creating great imagery. Often times, it is tempting to want to get out in the field when the weather is nice and predictable. While I’ll take being out in the field any day, sometimes we as photographers need to push ourselves to get out and shoot in weather and light that on the surface appears uninspiring but in fact leads to creating dynamic and unique imagery. When the weather is less than ideal and I decide to head out into the elements I try to stay local. I often stay local for a few reasons, but one of the important reasons to photograph locally is that I have a better understanding of how the weather will affect my area. Furthermore, instead of additional travel in adverse weather, staying local allows me to focus my resources and my vision on areas that I have a greater familiarity with. This familiarity of my local geographic area as well as how local weather phenomena will affect the landscape, allows me to be more productive with field time. So the next time your alarm clock goes off at 3:00 AM on a snowy winter morning, don’t hit the snooze button. Instead, use your knowledge and experience of your own local area to create unique imagery in less than ideal weather conditions. Posted in Boulder Open Space, Colorado, Rocky Mountain National Park on March 20, 2011 March 20, 2011 by Tom Mangan. ‘Winning’. The word is simple in meaning, but often more complex to define what actually constitutes a win. It has become a popular catch phrase of late because of its frequent use by a popular celebrity. While I wont use this blog to explain the many beneficial uses of acquiring ‘tigers blood’, winning as it pertains to photography is not so easily defined. From my point of view, I register a win each time I am lucky enough to get out into the field with my cameras and photograph. Many times, I may head out into the field and encounter circumstances such as poor weather, or poor lighting that may prevent me from actually capturing any images at all. Though I am grateful to be spending time out in the field regardless of the underlying circumstances, there are times when I may return from a shoot feeling at a loss or unsatisfied with my results. Even when all the stars align, human error may prevent a photographer from successfully capturing an image. For a photographer, using your vision to execute successful photographs can be challenging and difficult but also very rewarding when it all comes together for you in the field. Many of the photographers I greatly admire often state that capturing only a handful of images each year that portrays their vision constitutes a success. While I tend to agree with this line of thinking, I find there are some landscape photographers who are able to spend a short amount of time in the field and return with more than just a handful of portfolio worthy images. Those photographers may of course feel their efforts and results were all in vain. When attempting to ‘win’ at landscape photography, perspective may be the most important trait. Each time I venture off into the field, it important to value that time to hone my skills, improve my craft and hopefully capture some compelling imagery. As the old saying goes, ‘a bad day in the mountains is better than a good day at the office’. Posted in Boulder Open Space, Colorado on March 13, 2011 April 10, 2011 by Tom Mangan. Borrowing a line from one of my favorite sitcoms of all time, Seinfeld, off we go into the blogging world. As much as I enjoy photography, I also enjoy writing and sharing my photography. I plan on using this blog to detail my travels and adventures as well as my often disjointed thoughts on various subjects and topics. 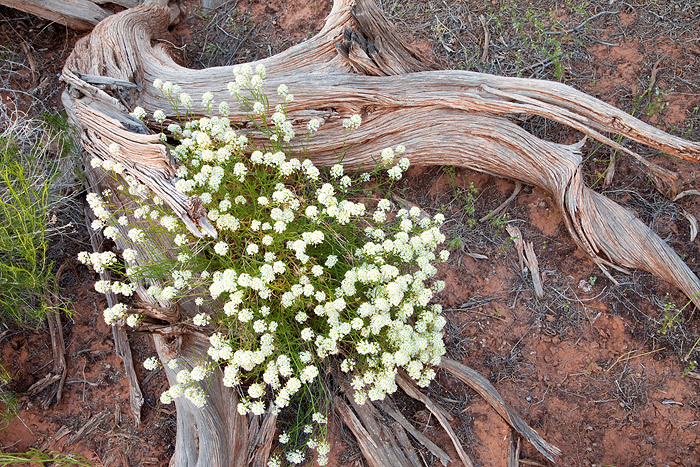 One of my New Year’s resolutions for 2011 was to actively start blogging as well as to post imagery more often. As often as possible I will update my blog with new images and photographs. How frequently do I plan on updating the blog?. At this point I have made it a goal of mine to update the blog at least once a week, hopefully more. Come hell or high water I plan on sticking to that plan. Obviously it took me a little longer than I wanted to get the blog up and rolling. Because it was a New Year’s Resolution of I’ve mine to start blogging in 2011, I figured what better way to introduce the blog than to include the first image I shot in 2011. I was suprisingly lucid on New Year’s morning and needed to get my ‘active’ dog, Jackson out of the house for some morning excercise. One of Jackson’s favorite spots is the area around Boulder’s Chautauqua Park. Conveniently, this also happens to be one of my favorite hiking spots. New Years Day started on the chilly side, around 8 degrees if I remember correctly. As we arrived at the trailhead, sunrise looked promising. 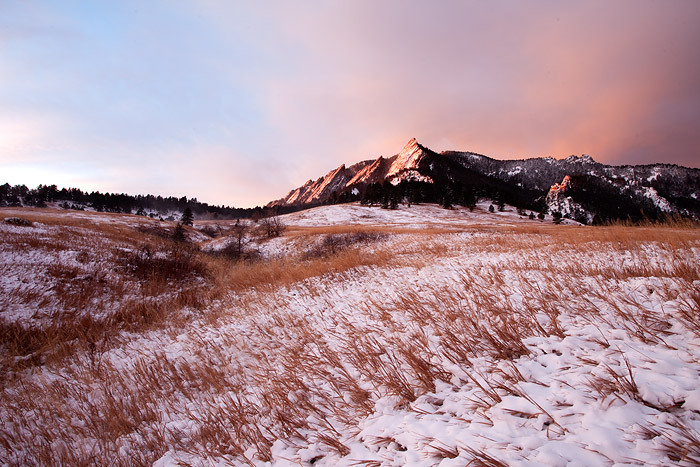 Clouds billowed over the Flatirons and there was a nice clearing along the eastern horizon. Off we went into the meadow and a few mintues after setting up my camera, 2011 greeted me with this image. Not a bad way to start 2011. Posted in Boulder Open Space, Colorado on March 11, 2011 March 20, 2011 by Tom Mangan.